1. Fur kids don’t fight over who gets the front seat. 2. There are no 3 a.m. phone calls to come and get your fur kid down at the local police station. 4. No screaming meemie temper tantrums in the grocery store. 5. A cross word won’t put your fur kid into therapy for years. 6. No arguing for just one more TV show before bedtime. 7. You can put a harness on a fur kid and no one screams child abuse. 8. A fur kid can’t argue about what they’re going to wear that day. 9. Fur kids don’t pick their noses. 10. You get truly unconditional love. HAPPY MOTHERS DAY TO ALL THE FUR KID MOMS OUT THERE. Monday evening. Since it’s that time of the year, I found myself mowing the yard Monday after work. The rule at our house is that once I’m done mowing, the kids get to go out into the back yard and run around like crazy in the newly mown back yard. They think it’s great to smell everything after it’s been chopped into bits. It’s a bit like a newly tossed salad. I go out with them because I enjoy the smell of a newly mown lawn and its fun to watch the four legged nutters run and play. came to a stop. Nothing seemed wrong and she started running again. I let my breath out and that’s when the screaming started. 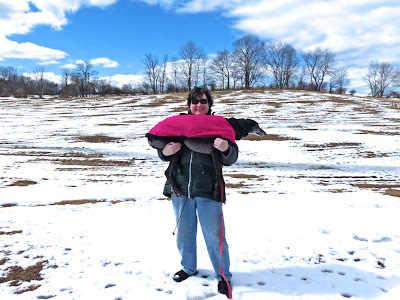 She stood there holding up her right rear leg, screaming. I reached her and she was still screaming. There was so much screaming. I could immediately see the cause of her distress. Just above the hock on that leg was a large tear. 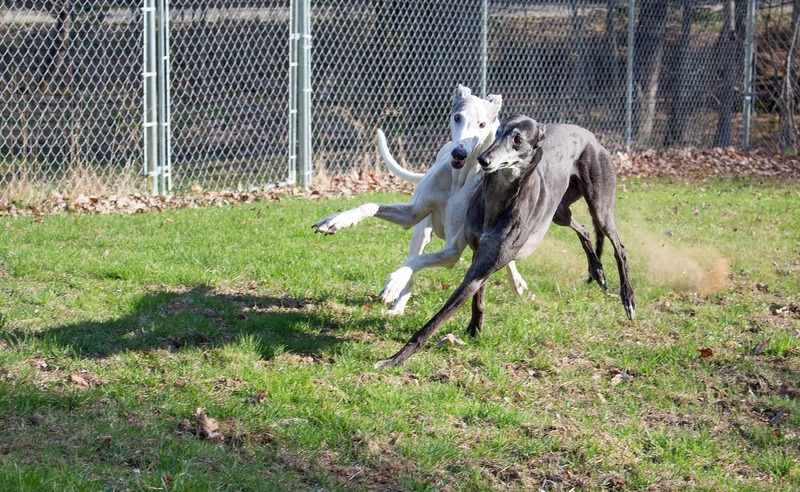 You can take a moment and look at that part of your greyhound. I'll wait for you. There isn’t much skin there. So when it let go, everything that is in there was suddenly clearly visible. Arteries, vessels, ligaments, tendons and yes, bone. It had, in fact, torn through on the other side as well. If one had been of the mind, one could have put their finger all the way through. learned my lessons. This tear was ten times worse and my initial instinct was to panic just like last time. But I managed to keep panic, nausea and tears at bay. I tried to get Bettina to stay where she was outside while I went inside to get the first aid kit. Of course, being Bettina, she had her own ideas and when I got back with the kit, she was laying down in the living room. Having exerted herself, the blood began to spew and there were splatters of blood up the stairs, all across the kitchen floor and soaking into the carpet. 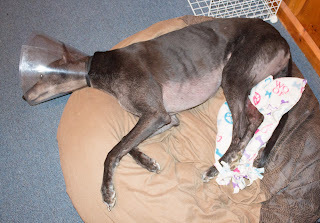 I managed to get her bandaged with a roll of gauze and covered that with vet wrap. During this time Blue was outside standing like a handsome white statue at the bottom of the stairs, trying to peer into the open door. I called him in and got him in his crate. I got the car and drove it up to the back door. Her Highness Crown Regent of Fussypants got a carried to the car like a foreign pasha. Ms. Fussypants did not learn much about being a good patient from our last adventure as she made me pull over on the way to the vet to put her muzzle on so she wouldn’t tear off the bandages. Meanwhile she’s spreading blood all over the back of the car. I had called ahead to the emergency vet so they were expecting us when we got there. They checked her over and prepared paperwork for surgery. I had the discussion with the doctor about greyhounds and anesthesia and I took the leap of faith that I’d get her back in one piece. Off she went on three legs into the bowels of the emergency vet and I took up my position on the hard wooden benches in the waiting room. Why are they always hard and wooden? I sat there for about 100 years (actually 1 ½ hours as judged by the fact that three half hour shows came and went). Then I was jolted from my stupor by an unearthly howling. There was no mistaking the voice. It was Bettina. She continued howling and the howls sounded so lonely and scared that I must have had my thoughts clearly on face. The receptionist told me she was OK, just waking up from anesthesia and that all dogs did that. I was still considering going out back, finding her and just cuddling her in my arms. Not doing just that was amazingly hard. But at least I had conclusive proof that she had come through surgery and was still breathing. And on more sober consideration, it is not unlike Bettina to have something to say about every situation she finds herself in. her up. It looked like the bone, tendons and ligaments were all intact with no damage. 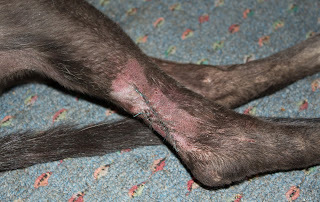 Bettina had also barely missed damaging some major arteries in that area. All in all, we were pretty lucky. The doctor let me know that as soon as they could get her walking around, I could take her home. A few minutes later they came back out to tell me that Bettina was refusing to walk. She had put the brakes on and wouldn’t budge. At that point I knew that Bettina was most assuredly back. They brought me out back to see if I could get her moving. I came upon a half-circle of vet techs and other veterinary personnel all looking down at Bettina. She was wearing a cone of shame, had all four feet firmly planted on the floor and was leaning back for all she was worth. She was still quite stoned so it took her a moment to recognize my voice from behind her and a few more moments to figure out how to turn around. But shortly she was in my arms asking me WTF? straight line. 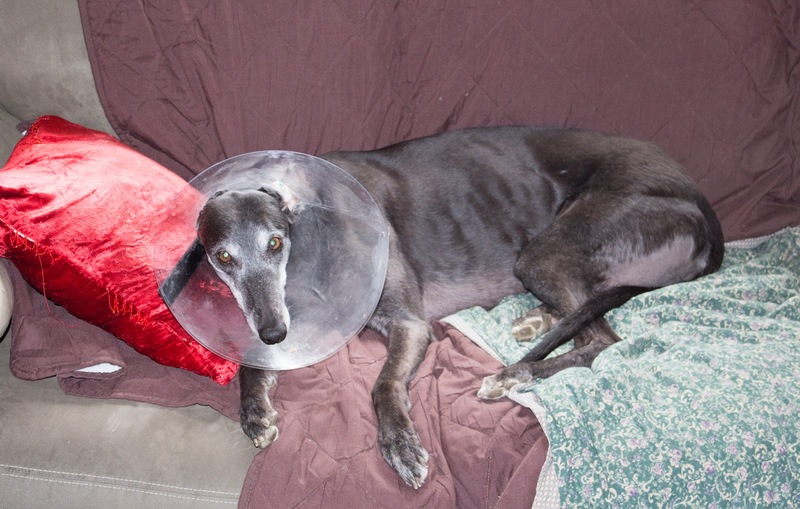 The anesthesia hang-over combined with her unfamiliarity with the operation of an Elizabethan collar had her swerving, weaving, lurching and crashing into every wall, door or piece of furniture on her way out. The vet tech had all he could do to steer her. They had left the surgical site un-bandaged and I received instructions to begin her on moderate exercise starting tomorrow in order to encourage what little skin there was to stretch and grow in. 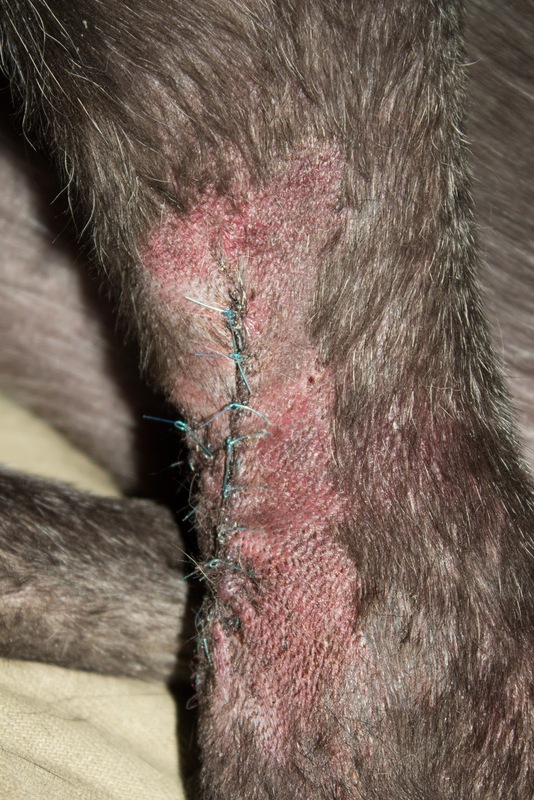 The doctor had done an incredible job stitching her back together. I wouldn’t have said it was possible given how little skin there was and how large a hole she had to work with. We made it home. 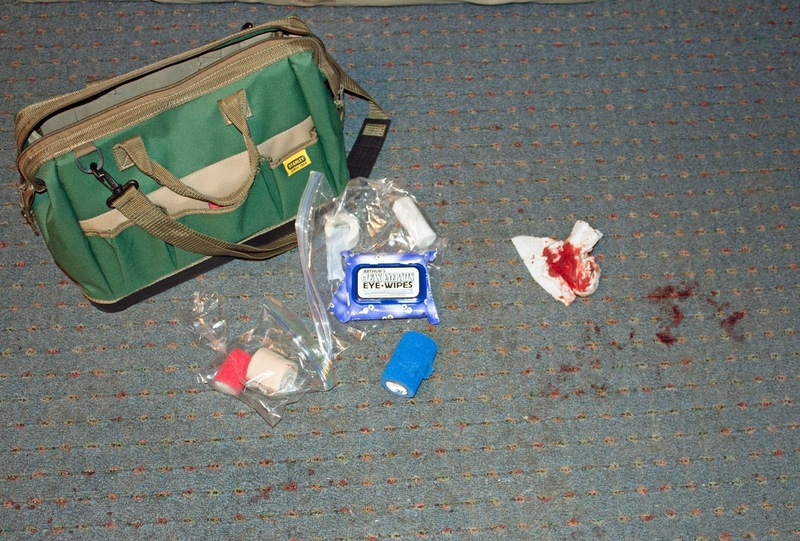 I attempted to clean up the murder scene but the carpet is not likely to survive. I let Blue out of his crate and he has spent the last 24 hours glued to my side. After a restless night, Bettina is actually weight bearing more and more today as the day has worn on. She’s going up and down the stairs on her own. 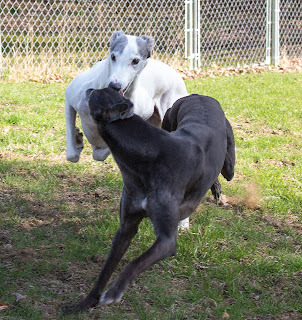 When I came out into the living room and found Bettina plying her attentions to Blue’s breakfast bowl, licking and re-licking and licking it again to get every last molecule that she or Blue may have missed at breakfast-time, I knew that Beelzebettina is fully back. Having earned my first aid merit badge, I’m working on my sewing badge. I’ve got a Bettina-sized coat made out of bubble wrap almost complete. It has happened again. 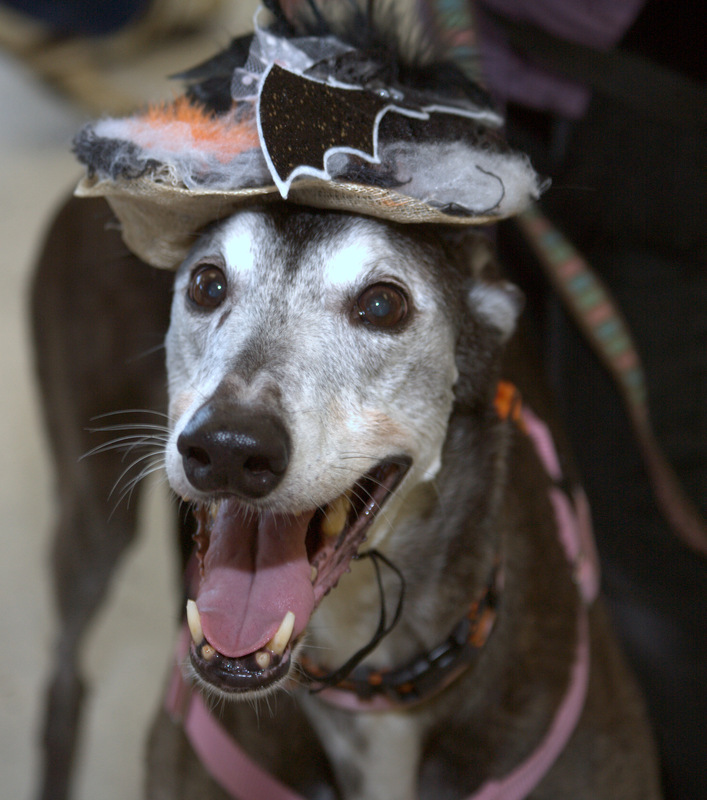 We have lost another special greyhound to the killer cancer. 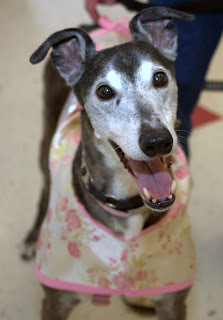 Since Girly Girl’s passing, I can’t read any story about a greyhound losing the fight to cancer without breaking down. It doesn’t matter that I don’t know the people or the hound involved. I feel connected through the fraternity of pain and loss. But this time I do happen to know the people and the very special girl we lost this week. Dear friends Pat and Rick did the unthinkable. They bid goodbye to their sweet girl Emma. As goodbyes go, it was everything that anyone would hope to be able to give a beloved family member. They were able to let her go at home, with everyone who loved her best gathered around her to see her on to her next journey. Emma’s cancer story sounds horribly familiar to any of us who have been through it ourselves. She developed an unexplained limp. It seemed to resolve. Then it came back. They had her examined and the vet felt it was orthopedic. She got pain relievers which seemed to help. But the limp came back. It always comes back. They had her x-rayed and it was a happy day when Pat sent us all an email letting us know that the vet saw no cancer. Finally, someone dodged that damned bullet. Except the limp came back. As it seemed to worsen with no explanation, the decision was made to do another x-ray. can’t do anything to change the outcome. 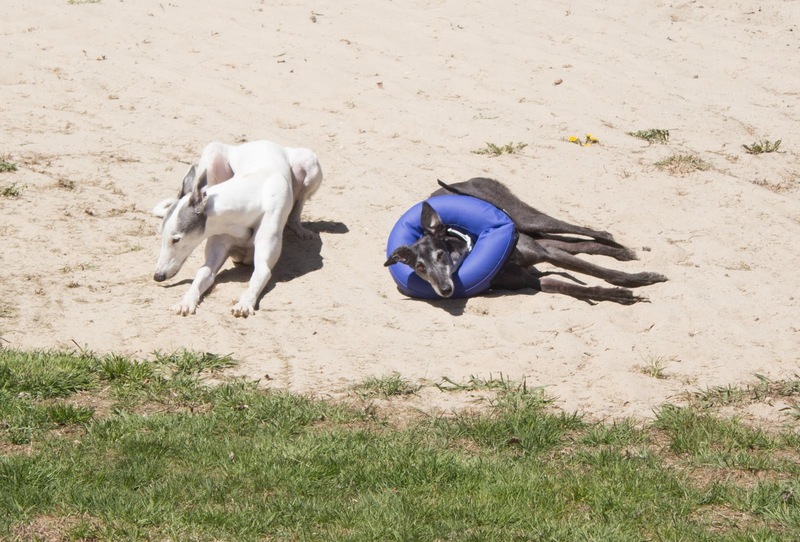 Emma was part of a family with her mum and dad and two other greyhounds, Vinnie and Jester. 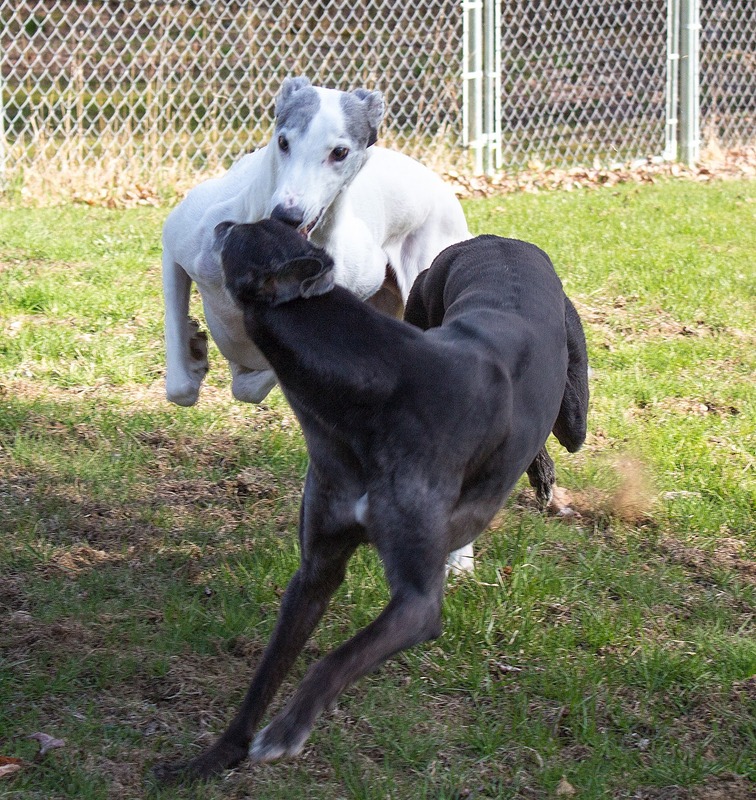 Emma had lost her brother Jim, a handsome blue brindle boy to stomach cancer not too long ago. The plan was not for her to see Jim again so soon. That is never ever the plan. Emma’s mum and dad did everything they could to make what time she had left comfortable and filled with love. As you hope for just one more day and then one more day, you watch as the one you love has some bad days. But they rally and most days are good. Then there is a string of bad days. What do you do? Is it time? How will you know? A question with no good answer. So it was with Emma. She enjoyed her yard and flinging her stuffies. Her appetite remained good but the limp became more pronounced and the bad days came more often. Then after some particularly bad days, the vet was called. On a lovely spring day Emma headed off to see Jim, and Girly Girl, and Indy, and Taylor, and Louie, and Dickie and Dutch and Nora and so many others I have been privileged to know. I’d like to say I can’t imagine how Pat and Rick are feeling now, but I can. 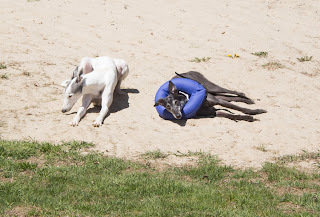 There is another hole in our greater greyhound family. Someone said that as long as someone remembers you, you never really die. I and many others will remember you Emma. We remember and we miss you.